Time to attend the School of the Viper. 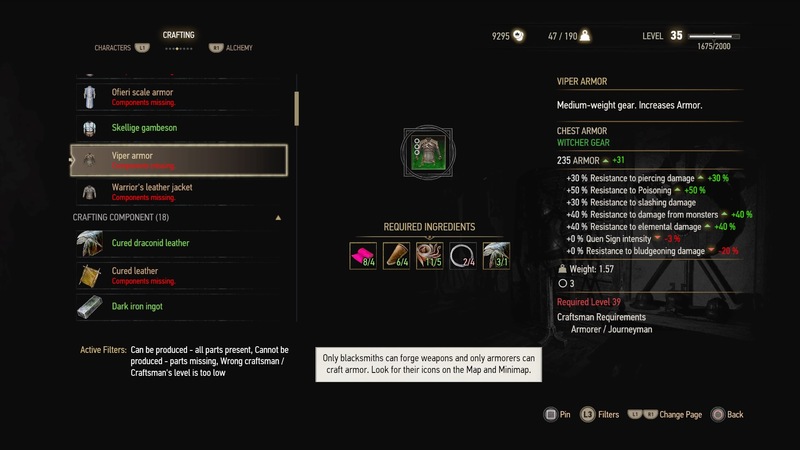 The Witcher 3 is no stranger to giving players the freedom to wear what they please, provided that they can find the item or are able to craft it themselves. To craft armor, you need to have either owned it or found its diagram somewhere out in the sprawling world that CD Projekt Red created for you to explore. Rarest among armor types are Witcher armors from specific schools. One such school is the School of the Viper. This particular armor set increases resistance to piercing, poisoning, slashing, monsters, and elemental damage, making it highly valuable for certain contracts, or when you want to delve into heavily infested areas. To obtain School of the Viper armor diagrams, you need only purchase them, but they can’t be bought just anywhere. Countess Mignole is a collector of all things Witcher and, after Master Vivaldi does a bit of coaxing, is willing to sell you a diagram or two provided you have the coin. To meet Countess Mignole, you will have to begin the Hearts of Stone main quest Open Sesame. Olgierd needs you to acquire something for him and it all starts at the Borsodi Auction House in Oxenfurt. Head over there where Master Vivaldi will get you into the event and then head upstairs. There will be three other nobles that you can fraternize with (this is an optional objective for the mission) before continuing the story mission. Head over the the older woman in the elegant gown to trigger a conversation. After finding out she’s into everything having to do with Witchers due to a past event in her life; you’ll be able to use this opportunity to purchase the Viper armor set, which includes Boots, Armor, Gauntlets, and Trousers. All four pieces can be purchased for around 400 Crowns (you should have much more by this point in the game). Be sure to buy what you want at this moment because she will later be unwilling to speak to you. Do not let this opportunity slip you by. After you purchase the diagrams, just head on over to an armorer to get this impressive set made. You may be of the School of the Wolf, but that doesn’t mean you can’t rock the Viper armor like a boss.